As part of testing the new i1Pro 2 spectrophotometer, Keith Cooper has been looking at its use in black and white printing. Many higher end printers now have a black and white print mode capable of extremely good results with manufacturers’ own papers. Many third party papers will work just fine, but a few need a bit of a helping hand when it comes to linearity. The article looks at using various test images and software (links supplied for download) to fine tune the look of prints, avoiding for example, the ‘crunched up’ shadows that can be found when using some papers. I’ve reviewed many printers over the years, and one area that I’ve noticed real improvements with, are their dedicated monochrome print modes. If you’re new to B&W printing, then there is an entire section of this site devoted to articles about Digital black and White photography. In particular, do have a look at the printer reviews, where most include sections relating to B&W printing. As part of my own print quality testing a few years ago, I created a specialist B&W Test Print Image. It’s deliberately designed to be a harsh test of B&W printing capabilities, and incorporates features that show up all kinds of print issues. The image is available for download on the page describing its features and use. 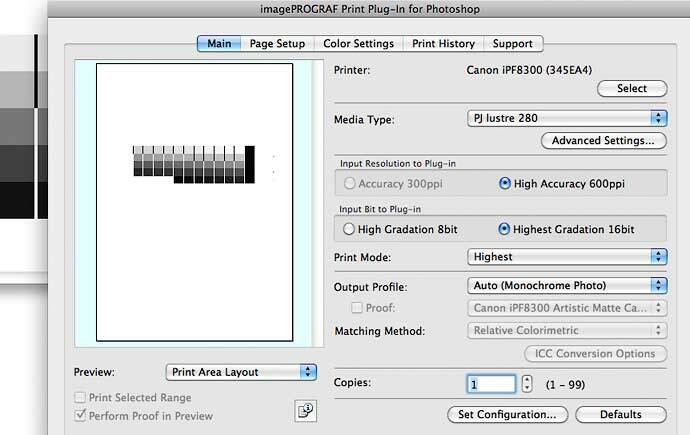 There are several ‘quick checks’ in the image that give a good feel for how your printer is performing with your chosen paper. The ‘bulls eye’ at the top should be smooth and free of bumps and coloured rings. The print should look black and white – i.e. no colour tints (unless you are testing print toning). The copyright text in the bottom right of the second picture should be clearly visible right to the end of my name. It may need a bit of care to see it, but it should still be clear (in good light). In 2014 I produced a new version of the image that includes a 51 (or 21) step wedge that you can read with ColorPort. One of the commonest problems I’ve noticed with third party papers when used in B&W printing is a tendency to crunch the shadows. The simplest way to fix this is with a Photoshop adjustment curve layer, where the curve counteracts the non-linearity of the printing. I’ve an article covering this, actually dating from well before printers started having B&W print modes. That’s great, but unfortunately they don’t always work if you want to use the printer driver’s B&W print modes, such as ‘ABW’ with Epson printers. Note: this functionality seems to vary with software and computer system. 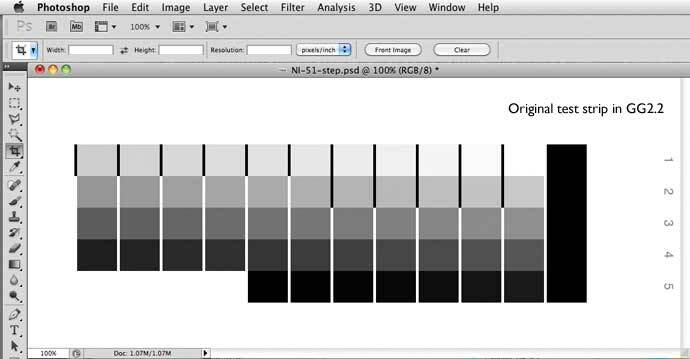 Whilst testing a Canon Pro-1 printer I found that with Photoshop CS5 I could specify the printer profile when printing B&W (Mac OSX 10.6) So, if it works, then fine, if not then you can always do the assign/convert steps below. 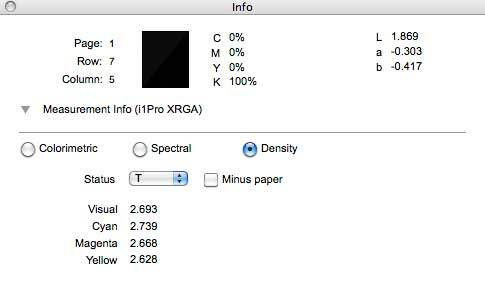 These modes often give deeper blacks than is capable with colour printing and the Canon version (via the Photoshop print plugin) is what I’ll often use with our 44″ width iPF8300 printer. You can get the profiles to work though, if you take the following two steps before printing. Secondly, convert back to a gamma 2.2 profile to your image. Adobe 98 or GreyGamma 2.2 is fine for this. Third, print normally using the ABW print mode. But how to create that QTR profile in the first place? …that’s where the spectrophotometer and ColorPort software comes in. Note – if you’ve a SpyderPrint device or ColorMunki Photo I’ve more info on using them to create the profiles. 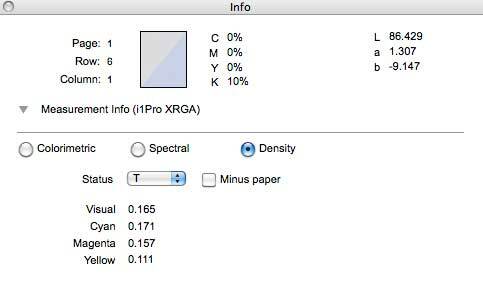 The QTR package contains a set of files and target images for using with an i1Pro Spectrophotometer. This relies on using the free version of X-Rite’s MeasureTool software to read in data from the spectrophotometer. Unfortunately, MeasureTool won’t work on newer Mac and Windows systems. 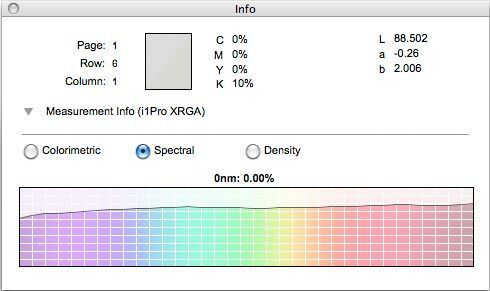 I’ve recently been testing the latest i1Pro 2 spectrophotometer from X-Rite. This comes with i1Profiler software, which I use to make ICC profiles for my colour printing. It doesn’t offer any functionality directed at B&W printing. 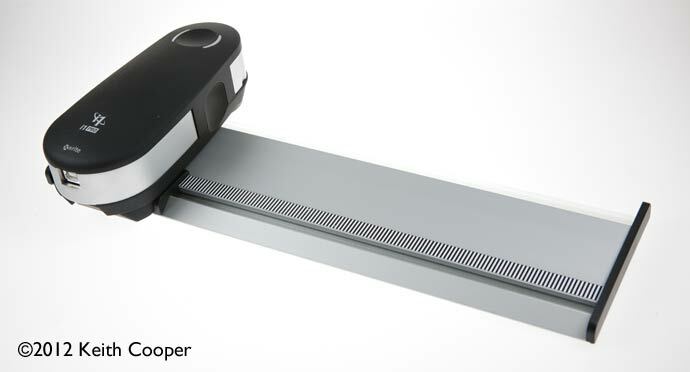 The i1Pro 2 spectrophotometer and measuring ruler, used in this article. Fortunately X-Rite produce some free software that works with the i1Pro 2 (and original i1Pro). 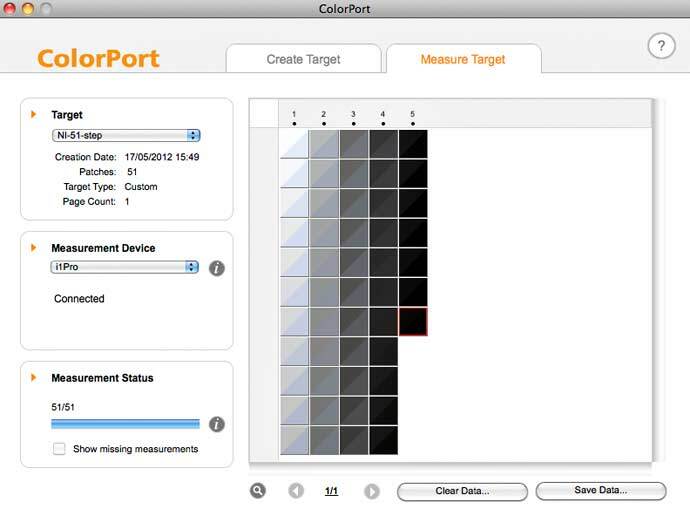 ColorPort 2 offers a range of functionality for creating targets and exporting measurement data, that work just fine with QTR’s ‘QTR-Create-ICC-RGB’ script. 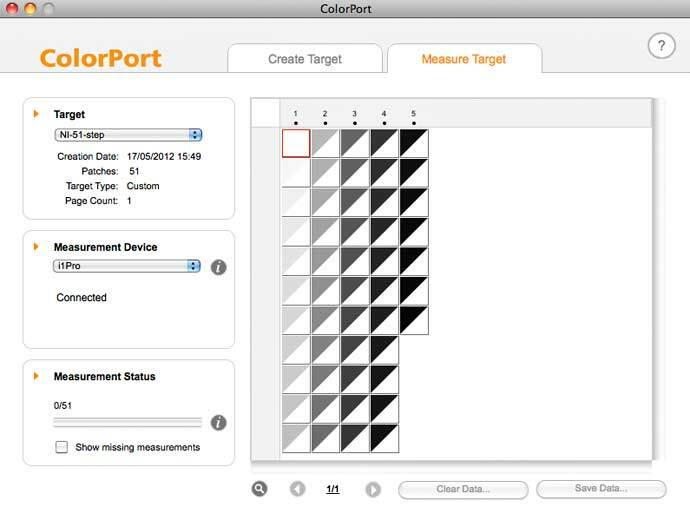 Working with ColorPort, I’ve created two versions of a 51 step target. They fit lengthways or widthways on an A4 (or letter) sheet of paper. The target data is required for reading the patches, and is available, along with the target images, free for non commercial use. Update – files for 21 Patch targets are now included, along with the patch definition files – some papers work better with the 21 step versions. 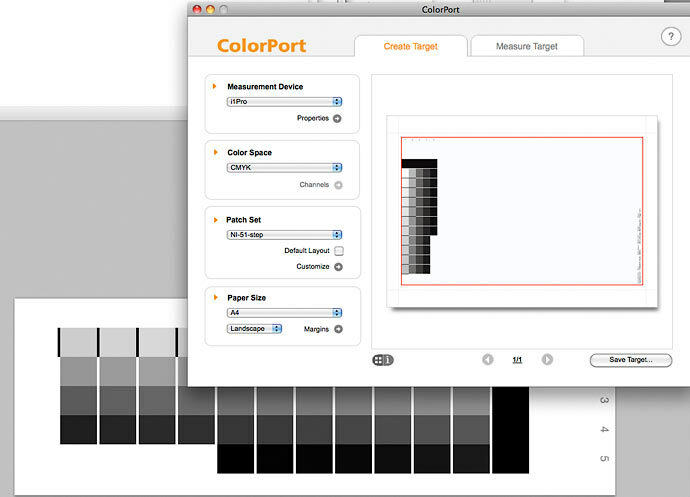 After extracting the target files, use the Target manager in ColorPort to import them. I’m testing this process with the same bright white lustre paper that I used in the i1Photo Pro 2 review. It’s a new paper, so I was interested to see how it performs for a number of different uses. 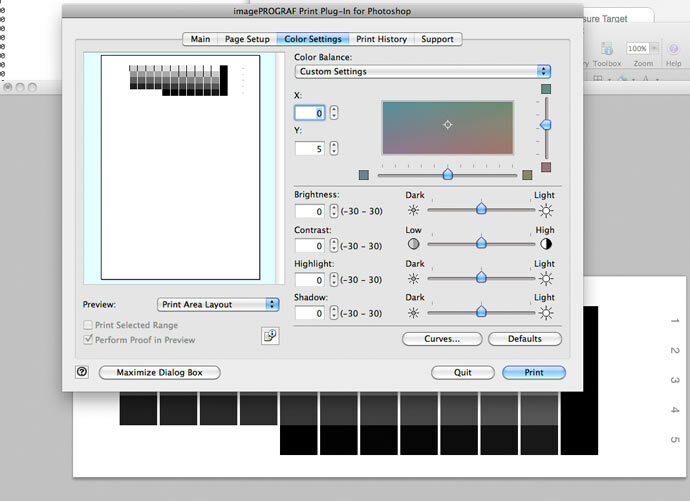 I’m printing the image on our iPF8300, via the Photoshop plugin and its Monochrome Photo mode. It’s important to print your targets here exactly as you would make a normal B&W print. Printing targets a different way is to invite uncertainties into your workflow. Normally for profiling you’d want to turn off colour management, but here we’re going to be using corrections outside of the normal print workflow, so I print normally. I also know that for a paper like this under normal viewing conditions, I need to add a slight adjustment in tint, to get a neutral image. There is an article I’ve written that shows how I worked out this adjustment figure, and how to balance slight tints in your B&W prints. Once dried (I prefer overnight for this), the target is measured using a spectrophotometer supported by ColorPort(not just the i1Pro 2). 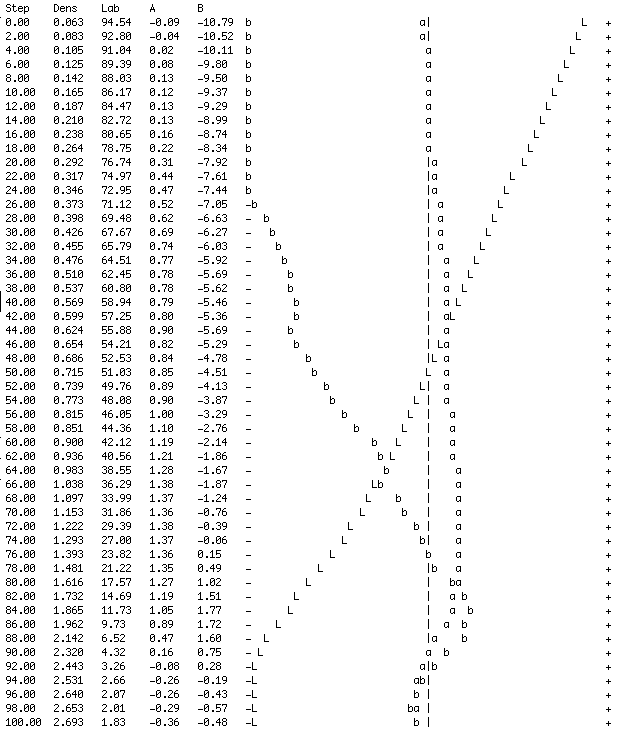 I’ve set it in ‘strip mode’ so that it can measure each line of the target in one go. The software will prompt you to calibrate the spectro on the supplied calibration tile. As each patch is measured, the lower half of the patch will show the measured colour. Notice how blue the lighter patches look? This is a sure sign of optical brighteners (OBAs) in the paper, and indeed I had been testing this particular paper to see how the new OBA compensation functionality of the i1Photo Pro 2 package worked. If you click on a patch, then a whole lot of measurement information is available. This is for the 10% grey patch. 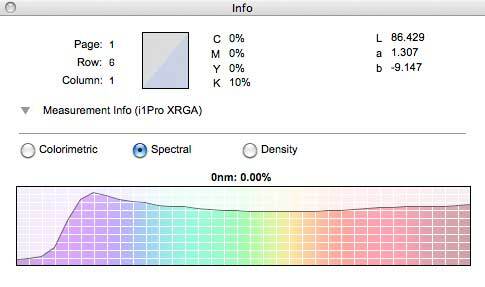 Here’s the spectral information, showing the distinct peak in the violet/blue part of the spectrum, typical of OBAs. Just to show the difference that you get with bright white papers, here’s the 10% data from a ‘warm’ natural OBA based cotton paper I’m testing. There are a lot of different formats you can save the data in, but for importing into the QTR-Create-ICC-RGB script, the tab delimited format is just fine (then just select the ‘Lab’ checkbox, no others). After dropping the data onto the script file, the following output is produced. Two things are very obvious from this data. First, the extreme negative ‘b’ values, showing the influence of the OBAs in the paper, and secondly the serious crunching up of blacks in the 90-100% range. Looking at my B&W test print for this paper, you can see the crunched up shadows, i.e. no real detail in the dark bits of the images. This is detail that I know for certain is there in the original test image (one more reason to use known test images for testing). I now have a profile that can correct for this non-linearity, by effectively smoothing out the L curve in the graph above. Next up I decided to print out a ‘corrected’ target file. Here’s the graph after reading in the ‘corrected’ target. 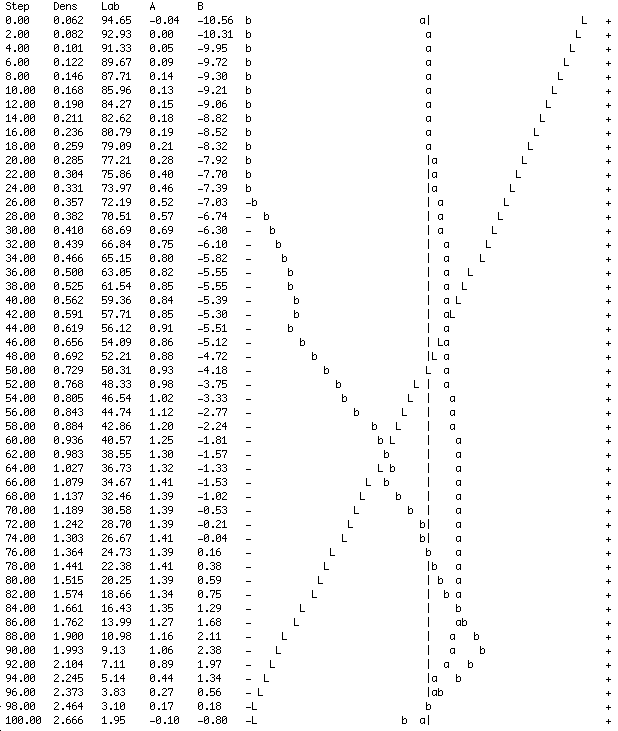 Much more linear (and visibly so in the test print), however the large swings on the ‘b’ axis show the effects of the OBA present in the paper. This would exacerbate the natural warmth of the black ink in the shadows. Having use MeasureTool for several years with my old i1Pro, ColorPort was something new to explore. It turns out that with a custom target, it’s exceedingly easy to use to create the profiles with QTR. I would encourage people though, to look at the output curves and consider whether the print quality might be different with an alternative media selection when printing. With the paper I’m using here (a development test sample form a UK supplier – not yet on the market) I feel that the suggested media settings may be applying a slightly too heavy ink loading. 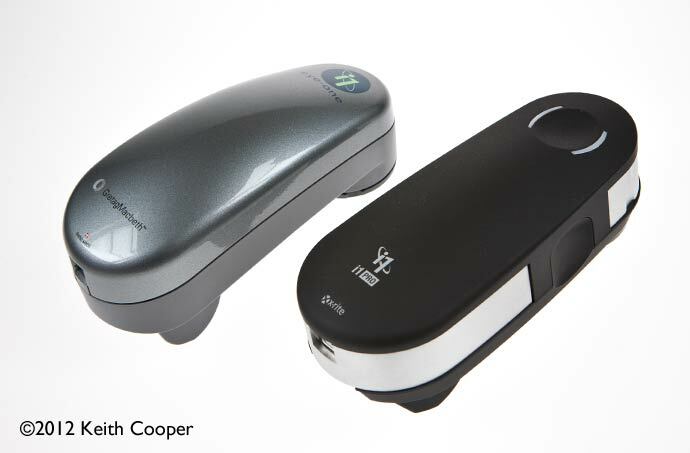 Note that ColorPort works just as well with the old i1Pro spectrophotometer (below left). I’ve recently reviewed two of X-Rite’s i1Pro 2 packages, if you’re looking for more profiling and colour management information. i1Basic Pro 2 – Includes i1Pro 2 spectrophotometer. i1Publish software for monitor and projector profiling. Spot colour measurement. 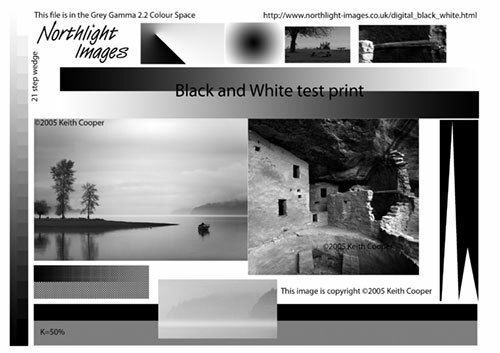 Monitor and printer quality verification (kit is enough to produce B&W profiles as described here, but does not include colour printer profiling). i1Photo Pro 2 – Contents are as with the Basic package, but adds colour printer profiling, including Optical Brightener Compensation capability. Two ColorChecker cards are included for print evaluation and the creation of DNG camera profiles.